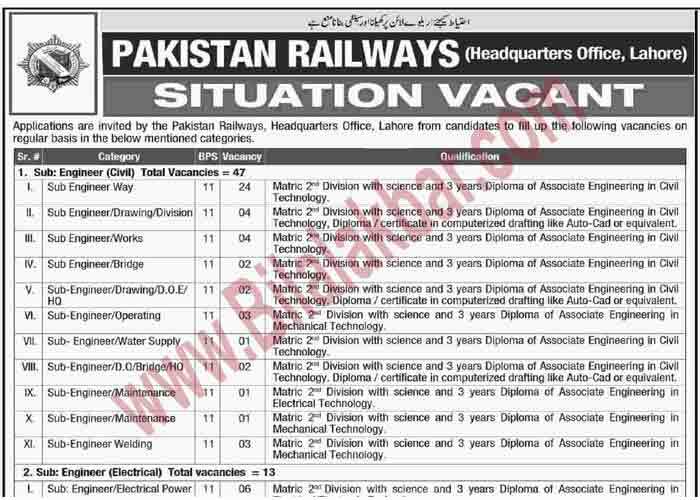 Applications are invited by the Pakistan Railways, Headquarters Office, Lahore from candidates to fill up the following vacancies on regular basis in the below mentioned categories. Technology, Diploma/certificate in computerized draftings like Auto-Cad or equivalent. Technology. Diploma/certificate in computerized draftings like Auto-Cad or equivalent. Matric 2rld Division with science and 3 years Diploma of Associate Engineering in Mechanical Technology. Mechanical Technology/ Mechanical Power Technology. Mechanical Technology/ Foundry & Pattern Making Technology. Mechanical Technology/ Machine Shop Technology. Mechanical Technology / Machine Shop Technology. Mechanical Technology/ Tool Design & Tool Making Mechanical Technology. area/region against whose quota vacancies are available Quota-wise distribution of these vacancies is given below. 2. Applicants can apply for more than one category as per qualification requirements. 3. The applicants shall submit their applications along with supporting documents directly to Pakistan Testing Services (PTS) on the below-mentioned address: 3rd Floor, Adeel Plaza, Fazal-e-Haq Road, Blue Area, Islamabad. and PTS (Pakistan Testing Services) at www.pts.orq.pk. a. 5% quota for Minorities/ non-Muslims in all categories. b. 5% quota for Orphans / Destitute in all categories. c. 2% quota for disabled persons for all categories. 1. 18-25 years + 5 years General Age Relaxation in upper age limit on the closing date for receipt of applications i.e. 09.122018. Tribal Areas, Azad Kashmir, and Northern Areas are relaxed for 3 years in addition to item No.1 above. Forces of Pakistan, whichever is less. date for receipt of application is relaxed by 10 years up to the age of 55 years. 5. The age of disabled candidates is relaxed by 10 years. 6. The age of widow or child of deceased Civil Servant who has died during service is relaxed by 05 years. relaxation in age only in one category. 1. The application form shall be filled online by visiting PTS (Pakistan Testing Services) Website i.e. www.pts orq.pk. Adeel Plaza, Fazal-e-Haq Road, Blue Area, Islamabad. attached with application form) or demand draft of any Bank payable in Islamabad in favor of M/S PTS (Pakistan Testing Services). attached with a hard copy of the application forms. 5. The departmental candidates shall submit their application through proper channel. 6. The last date of submission of applications is 09.12.2018 up-to 05.00 P.M.
laid down criteria are eligible to apply. candidates by PTS (Pakistan Testing Services) at least one week before the test. 10. No TA/DA shall be admissible for test/interview. Join duty anywhere in Pakistan Railways systems. as canceled and legal action may be taken.